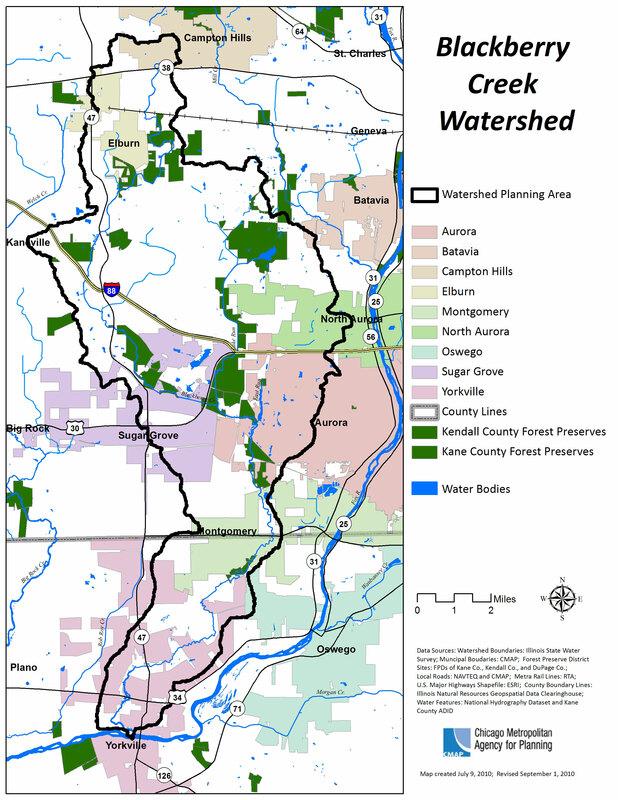 The Blackberry Creek watershed spans south-central Kane and north-central Kendall counties and covers portions of the Cities of Aurora, Batavia and Yorkville, and the Villages of Campton Hills, Elburn, Montgomery, North Aurora, Oswego and Sugar Grove and has a drainage area of nearly 75 square miles. Several tools were developed for the watershed after the 1996 floods. Of note, the Blackberry Creek Watershed Alternative Futures Analysis and Fiscal Impact Study and Blackberry Creek Watershed Zoning Analysis and Ordinance Language Recommendations. Also, the first Blackberry Creek Watershed Management Plan was produced by the Blackberry Creek Watershed Resource Planning Committee in September 1999. These tools and the stakeholders involved in their development were important assets during the process of updating the Blackberry Creek watershed plan. The Conservation Foundation began working with the Fox River Ecosystem Partnership (FREP) and Chicago Metropolitan Agency for Planning (CMAP) in the fall of 2010 to update the Blackberry Creek Watershed plan and incorporate nine elements that are now required by the Illinois Environmental Protection Agency. The Conservation Foundation provided watershed coordination and outreach efforts throughout the planning process and continues to support stakeholders as they implement plan recommendations. The final watershed plan was submitted and approved by Illinois EPA. To view the plan, click here.